Our top selling throw blanket of the season: The two-tone Lux-Plush Rosebud Throw. Cozy Luxury at its best! Ohhhhhh so soft and luscious. 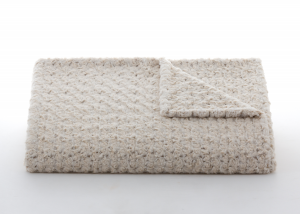 This throw blanket is perhaps the most comfortably soft snuggly sensation we have ever carried. Stylish and cozy these throws make great gifts and are a great way to give a gift to yourself. Wrap up in stylish luxurious comfort without hurting your finances. These are not 100% natural or organic but they are incredibly soft and luxurious and 100% Made in the USA. We also carry a matching scarf so you can bring the soft luxurious feel outside with you and snuggle up under its incredible comfort. Click here to see the scarf and add it to your cart. You'll love the way the scarf and throw blankets feel. Tiny rosebuds create a plush softness like no other. Just touch it and you'll melt! Click here to see a close-up image of the material. These top-selling items at Earthsake are going fast - so get yours today and wrap up in luxurious comfort.